One of the key issues in understanding a national film culture—who are we?—is understanding who we are not. In the case of Canadian cinema, part of that definition has always been clear from the outset. “We are not Hollywood,” that unavoidable behemoth down south. The need to figure out what a uniquely Canadian cinema might look like was, for a time, such a point of national pride that it resulted in the creation of government funding bodies, the likes of which Americans could only dream of. Today, however, in the post-Reagan-Thatcher-Mulroney years, such government largesse is constantly under threat. It’s not even so much that the funds have dried up, although there is not nearly as much grant money as there used to be. It’s more of an attitude that anything creative and meaningful can only emerge from the private sector. Since the 1980s, we have been taught to expect that national governments are lumbering and inefficient, and that they can only stifle individual initiative. Certainly genius could never flourish on the federal dime. 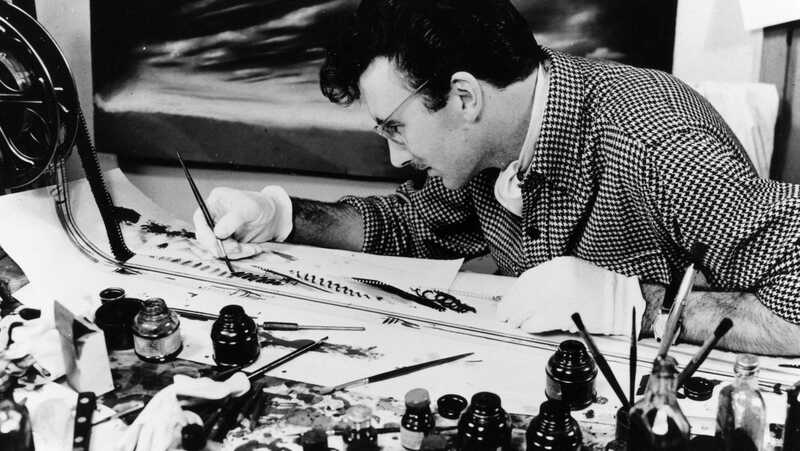 But the career of the great Canadian animator Norman McLaren gives the lie to this anti-government bias. McLaren’s earliest works from the 1940s may have been utilitarian in nature, promoting war bonds and wartime price controls. But the films were never just “propaganda.” And in time, McLaren was able to abandon that didactic impulse altogether and focus on experimental works that stretched the boundaries of the cinematic form. We can look back at this body of work, spanning five decades from 1933 to 1983 and almost all of it created under the auspices of the National Film Board of Canada, and see exactly how the vision of a free man could in fact thrive and find a wide audience with the support of his government. Like his NFB colleague John Grierson, McLaren was Scottish by birth, and the two men initially worked in Great Britain making films for the Film Unit of the General Post Office. Grierson, who many credit with inventing the term documentary film, was equally inspired by the poetic realism of Robert Flaherty and the precision montage of Dziga Vertov. As such, he was drawn to men and women who could communicate concepts in accessible yet unconventional ways. He hired McLaren after seeing some of his student films, and the two men worked together at the GPO from 1936 to 1939. In 1938, Grierson was hired by the Canadian government to conduct an audit of the nation’s promotional film services. After providing his report, he returned to Scotland but was invited back to implement his own recommendations. So he moved to Canada in 1939 to form the NFB. McLaren followed him shortly thereafter, in 1941, as did director Guy Glover, McLaren’s life partner. Initially the Film Board was making war propaganda films, many aimed at the U.S., which had still not entered the war. McLaren’s unit was tasked with making animated commercials encouraging Canadians to buy war bonds. Among these films are two of McLaren’s early classics, Hen Hop (1942) and Dollar Dance (1943). Both were drawn directly on celluloid, frame by frame, although with their broad pen work and solid color backgrounds, they only hint at the intricacies of McLaren’s later films. Starting in 1942, McLaren was given the freedom to assemble a team of animators with whom he would work for most of his career. These included Jim McKay, George Dunning, and Evelyn Lambart, McLaren’s collaborator on Begone Dull Care (1949). This group, with McLaren as the head animator and mentor, came to be known as Studio A, and worked within the NFB with relative autonomy. The NFB’s stated mission was “to produce and distribute and to promote the production and distribution of films designed to interpret Canada to Canadians and to other nations.” They answered the call by creating a distinctively Canadian animation form for an international audience, with a focus on a combination of modernist experimentation and populist modes of address. Despite being part of a government agency, the group were able to make films the way they wanted to under McLaren’s leadership, and his Studio A apprentices all eventually became lead animators in their own right. And what sorts of films did McLaren create with this unique governmental support? In a sense, McLaren’s place in cinema history can best be understood as analogous to that of Grierson’s. McLaren wanted to apply the techniques of visual modernism in more accessible contexts, just as Grierson had aimed to do with the techniques of advanced modernist nonfiction filmmaking. While American character animators such as Tex Avery and Chuck Jones were employing modernist techniques of flatness and distorted space to denaturalize their narrative worlds, McLaren was tipping the balance, using hints of recognizable figures to “naturalize” pictorial fields reminiscent of the work of Matisse and Paul Klee. 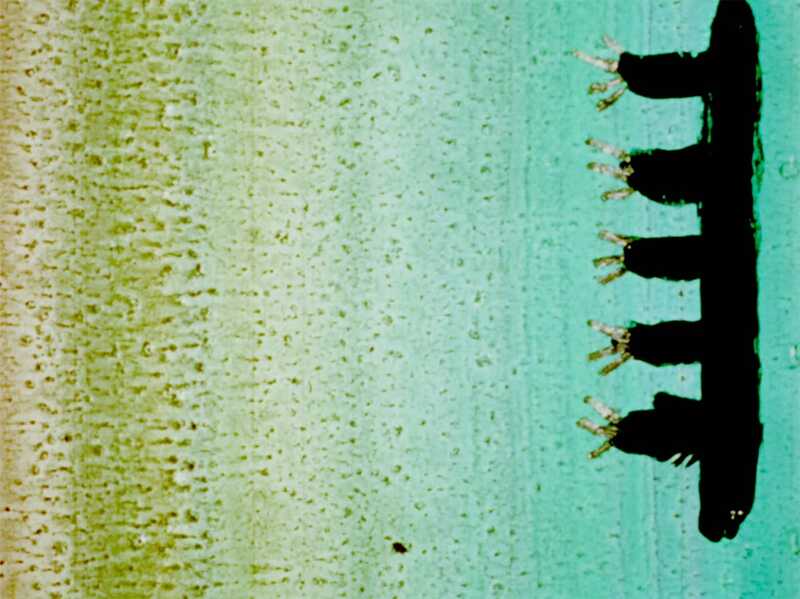 From the start of his work at the NFB, McLaren used his relative freedom to explore the fundamentals of filmic material, engaging in many of the practices that became emblematic of avant-garde cinema of the 1940s, ’50s, and ’60s. He scratched images directly into the film emulsion. He painted on clear celluloid. 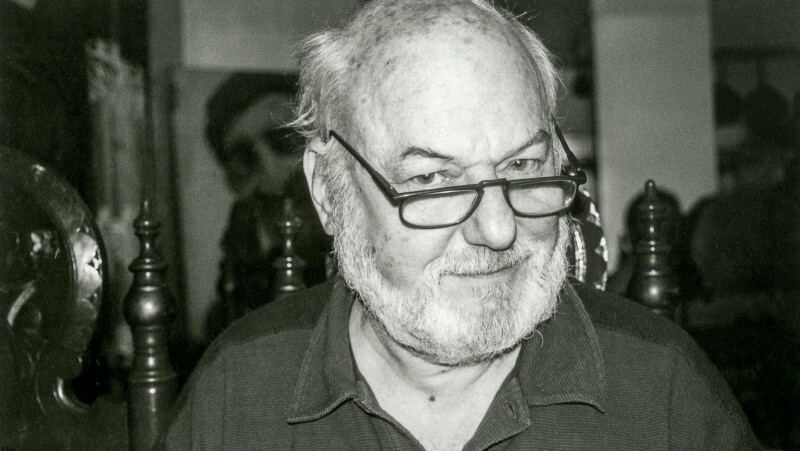 He employed stop-motion animation in both live-action and abstract capacities. He experimented with pixelation. He produced loops and stutters in editing using the optical printer. And he also explored the possibilities of musique concrète, by cutting and scratching directly into the optical soundtrack strip on the film itself. But even though McLaren’s work is clearly a part of experimental film history and its dominant trends, his sensibility was always more populist. His films are frolicsome and happy-go-lucky. They tend to combine abstract images with representational ones, and when they do not, they feature musical accompaniment that helps to rhythmically “explain” the movements of solids, stripes, and voids. 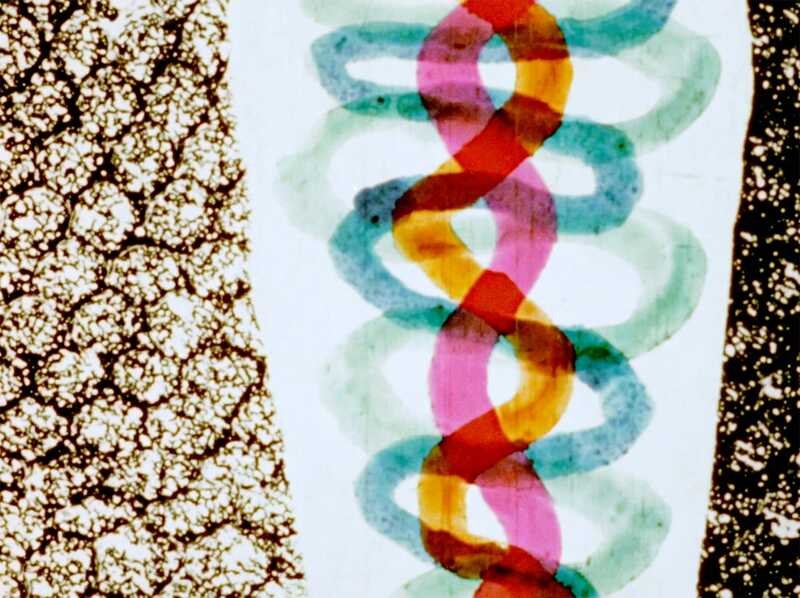 (Compare this with Stan Brakhage’s cinema, which shares many techniques with McLaren’s work but almost always maintains absolute silence, preferring to allow visual elements to assert their rhythm on their own.) There is an emphasis on pleasure in McLaren’s work, understood as a dialectic between the known and the unknown, the radical and the familiar. Begone Dull Care is a perfect example of this approach. Its basic idea is the creation of a visual jazz, a representation of the title track by the Oscar Peterson Trio. 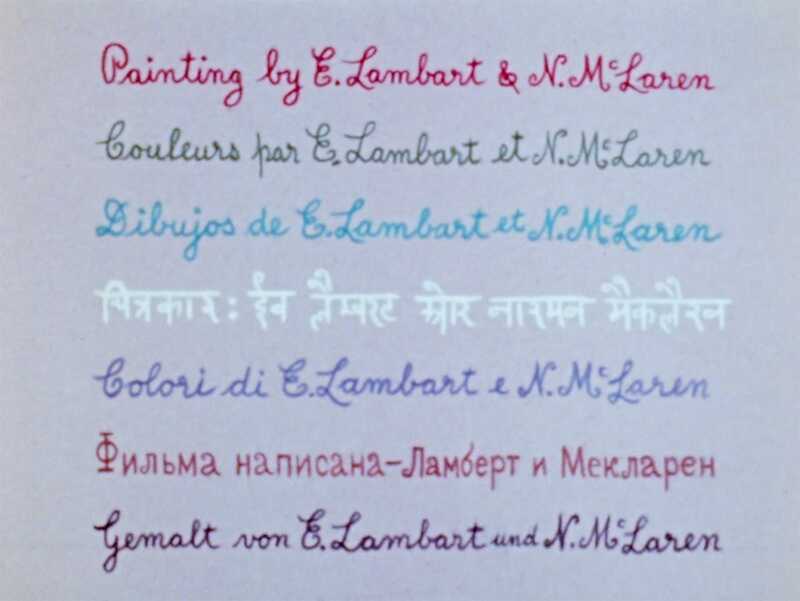 After introducing the title in seven different languages, McLaren and Lambart are off to the races in a thick skein of watery blues and purples, embodying the musical movement of the trio as a whole. But in the bass breaks, the duo clears a space for thick vertical stripes, as if the notes are clearing the cacophony. Soon after, the piano takes over as the instrument cutting through the thicket. 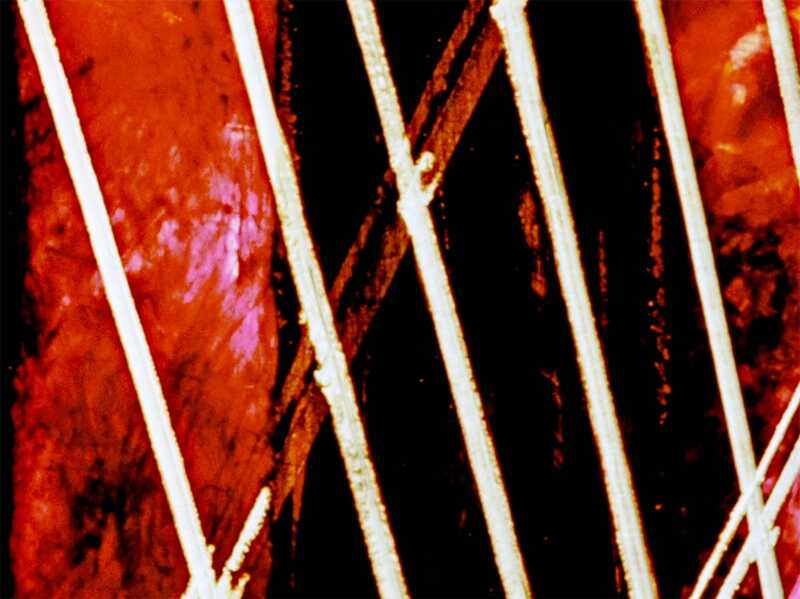 It is represented by horizontal and vertical lines sliced into the film strip, the broader musical fills represented by dense red leader with Chinese-like calligraphic brushstrokes, or a tan inkwash with purple blots and wiggles. This then gives way to an alternation of dancing hashmarks, some painted colors, others scratched into the emulsion. Various graphic designs on black—circles, spirals, arrows, wide arcs—begin appearing on the screen, “boogieing” to the piano riffs. The above description covers only the first minute and twelve seconds of Begone Dull Care, but it should offer some sense of the film’s method and its complexity. All of these patterns and colors zip by so quickly that they register as mostly unconscious rhythms and gestures, and although a close examination shows the obvious care that McLaren and Lambart took in creating the film, it also demonstrates that there is no repetition, no discernible pattern. The piano, for example, is not always defined by one kind of visual mark-making; the color red does not always indicate “hot licks,” etc. Instead, what we find is an improvisatory approach that embraces the open, footloose spirit of jazz. 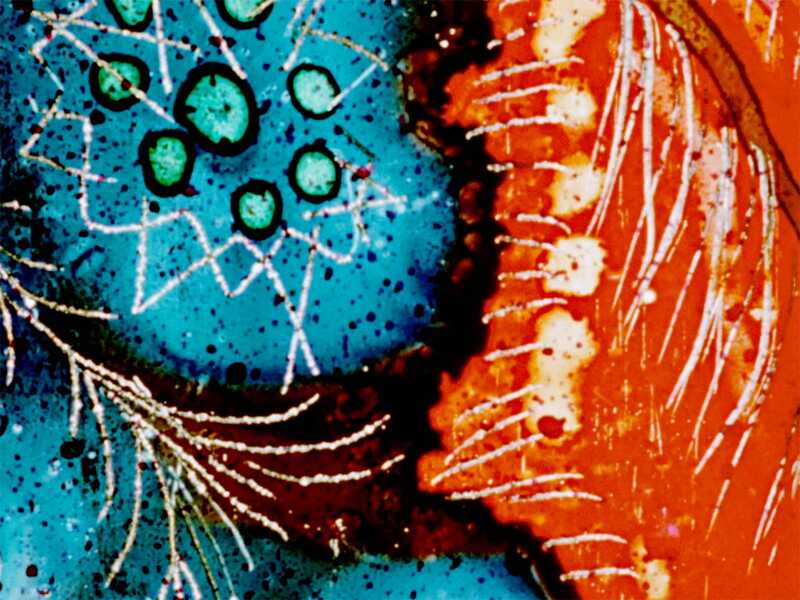 This is another aspect of McLaren’s work that links him to a certain lineage in experimental film history, the great animators of that tradition such as Harry Smith, Lawrence Jordan, and especially Robert Breer. Although McLaren is ever the master craftsman, his style borrows liberally from the playful, Matisse end of modernism. Within the underlying framework of a well-honed technique and aesthetic approach, McLaren often adopts an intuitive stance. He’s not trying to illustrate the music so much as “swing” with it. This is not to say that McLaren lacked the mastery of a great director capable of executing a work according to a meticulous plan. Far from it. Some of his best-known works exhibit his trademark sense of playfulness and wonder while demonstrating an exacting, frame-by-frame craftsmanship. His ballet film Pas de deux (1968), for example, uses high-contrast black-and-white film and precise optical printing to generate a kind of visual reverb for the dancers, their every gesture leaving echoes and trails behind them, recalling the early motion studies of Étienne-Louis Marey. Or there’s his late masterwork Synchromy (1971), a Mondrian-like suite of moving squares and rectangles that looks ahead to similar experiments in computer art. 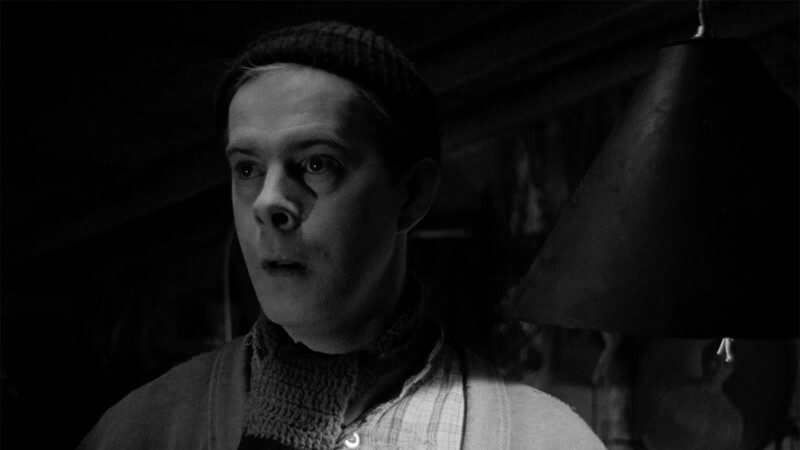 But few of McLaren’s films are as beautifully precise as Neighbours (1952), the film for which he is probably best known and which won an Oscar for best documentary short, among other international awards. 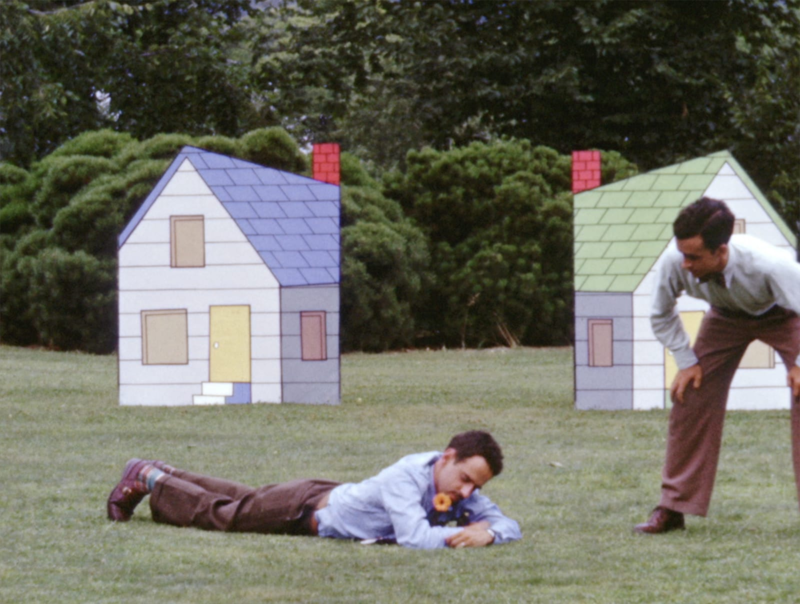 Made with NFB stalwart Wolf Koenig, Neighbours is an allegorical black comedy about war and destruction, played out between two suburban white men who live next door to one another. They are seen sitting in lawn chairs, reading their newspapers and being chummy toward one another, until a conflict literally sprouts from the ground. A small flower grows right on their property line. This simple bit of flora drives the men mad. They first start arguing over whose property it is. Then they try to fence it in. And before long, they are beating the hell out of each other with increasing savagery, even going so far as to destroy each other’s homes and kill the wife and child inside. By the end of the film, both men are dead and buried, each with a flower on his respective grave. By way of conclusion, McLaren offers this admonition, in multiple languages: love your neighbor. Neighbours is notable for its stop-motion animation, in particular its use of variable-speed action and single-frame movement. Given its meticulous play with space and perspective, it’s no wonder that Pablo Picasso called it the greatest film ever made. The men seem to float about in the air at times, or scoot along the grass as if propelled by an unseen force. The flower itself does little dances and even cowers in fright as the men get violent. While the message is clearly intended to be a timeless one—the newspaper headlines read “Peace Certain If No War” and “War Certain If No Peace”—it’s perhaps worth noting that the production of Neighbours coincides with the passage of laws to end housing segregation in Canada on the basis of race. Not only did McLaren provide cinema with experimental points of reference it never had before. He did so with humor, verve, and a genuine desire to communicate to the broadest possible audience. His NFB films were widely distributed internationally up through the 1960s, finding their way into many school and public libraries. 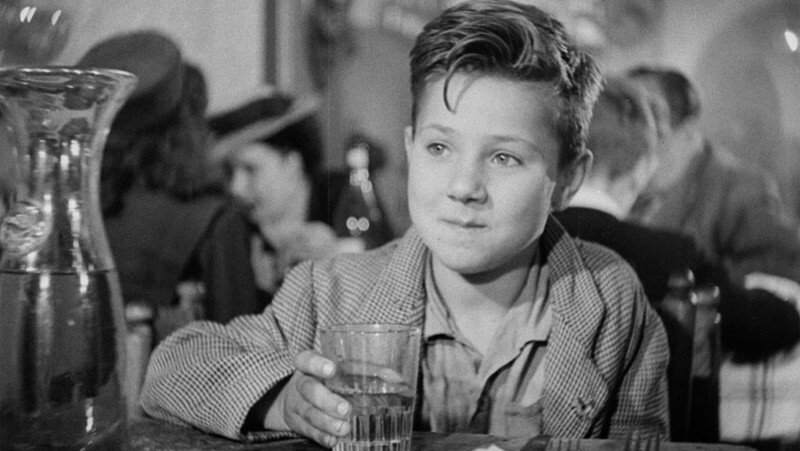 (Virtually every Canadian schoolkid of a certain generation saw Neighbours at some point, and many U.S. kids did as well.) In fact, the National Ballet of Canada has recently dramatized McLaren’s life and work in a new ballet, Frame By Frame, which translates his innovations in animation and stop-motion into movements for the stage. McLaren’s legacy, both in Canada and around the world, cannot be overstated. Not bad for government work. Begone Dull Care and Neighbours are available to stream on the Criterion Channel on FilmStruck. Michael Sicinski is a writer and critic who specializes in the analysis of experimental cinema. He is a frequent contributor to Cinema Scope, Cineaste, and Cargo. He also teaches film studies in the Art History Department at the University of Houston.